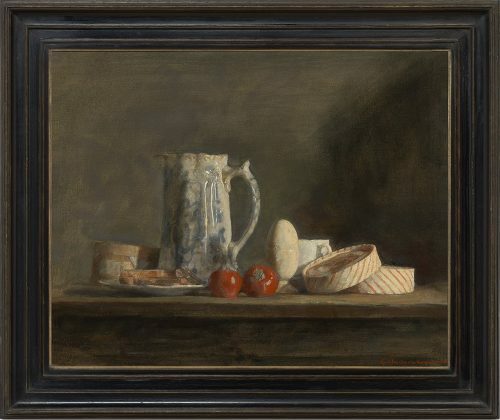 The artist’s sensitive treatment of tonal qualities, light, and his remarkable way of observing the tactile beauty of ordinary objects makes this a particularly striking piece. The pitcher has pristine whiteness, offset by a rough-hewn brownish grey background and the wooden table. The light hits the fruits and white surface of the egg, suggesting a moment in time, the ephemerality of the material pleasures in life. 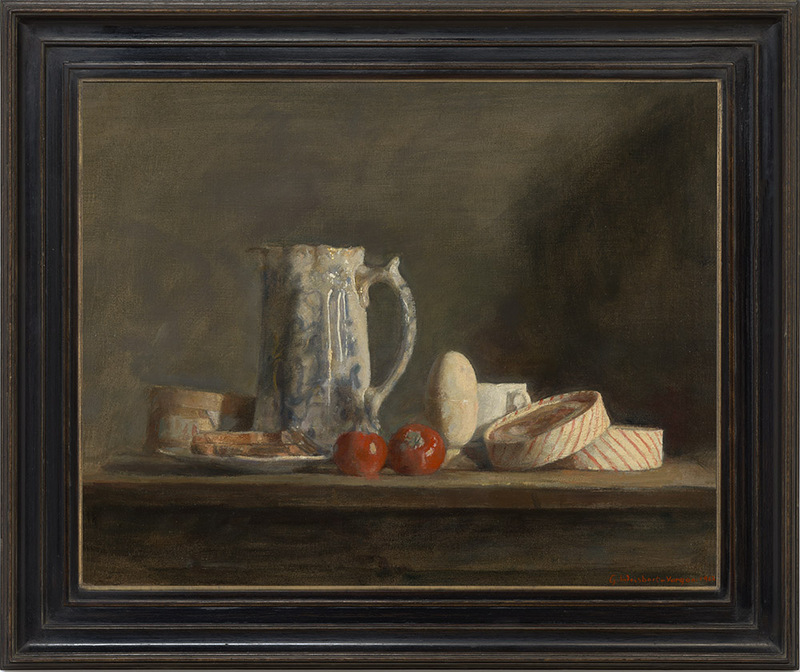 Like many modernist still life painters, this study of ordinary objects becomes a formal experiment. Weissbort successfully combines Vermeer like light with the familiar planes of twentieth century avant garde painting, and as such the picture clearly emerges as a deeply evocative and classic composition. George Weissbort (1928-2013) was born in Belgium and moved to London at the age of 7. He attended the Central School of Art & Design (now St Martin’s) where he was taught by Ruskin Spear and Rodrigo Moynihan. He was influenced by Arthur Segal to move from the abstract expressionism of the 1940s to realism, and by Bernard Meninsky, who taught life drawing at the Central School, to study the Old Masters. He turned first to artists such as Cézanne and Matisse, and later to Vermeer, Chardin, Velasquez, Corot, Titian and Piero della Francesca, amongst others. He has exhibited regularly at the Royal Academy, the Royal Society of Portrait Painters and the Fine Art Society. In 2006 he had a one-man retrospective exhibition at the Chambers Gallery, London, and in 2008 another at the Denise Yapp Gallery, Whitebrook, Monmouth. He has written essays on art criticism, looking at art, Lucien Freud, and Vermeer; these are available on his website, http://www.georgeweissbort.com/.